It is believed that the wolf ancestors of dogs followed the trails of early human hunters to feed off food scraps. The hunters were alerted by the wolves on the presence of predators in return. Thus, forming the human-canine bond. It is safe to say that centuries ago before the advent of agriculture, dogs were domesticated by humans for hunting and protection. It is hard to tell what led to the use of dog collars and leashes. There are several historical depictions of dogs wearing collars and leashes in ancient Europe, Persia and Egypt. The royal dogs in Egypt which were mostly used as guard dogs wore collars heavily embellished with precious gems. The watchdogs used for herding in Europe wore barbed collars for protection against predators. But as soon as dogs became affordable for everyone including the poor, collars started bearing name tags and padlocks which could only be unlocked by an owner with the key. In the modern era, dogs were continually bred as guard dogs and watchdogs for hunting and herding. But there were others bred as household pets for companionship. These breeds that were kept by wives and children as glamorous and loyal friends wore beautifully ornamented collars and leads. Pets need routine exercise to stay healthy and walking a dog on a leash helps in training and preventing it from running across a busy street. 1.2 Don’t Forget the Treats! 1.3 Are Collars and Leashes Necessary? A wide range of training equipment is now available to address training and behavior issues. Special collars, leashes and harnesses can make training easier for both you and your dog, although supervising your dog with patience and consistency is a necessary ingredient for effective training. Collars are excellent training and safety tools. Check that your dog always wears his collar, and that you have his license and identification tags on it. Even the most loyal and least curious dog can accidentally escape. If your phone number is on his tag, you increase the likelihood of his safe return. Some collars are designed to break if they snag on objects, lowering the chance of your dog choking to death. Leashes are essential dog training equipment. While on walks, in a non-fenced yard or at the park. You can stay in control of your pup by clipping a leash to his collar. Leashes can help with training, too. Whether inside or outside, Max knows you’re in control when he’s on the leash. Because of the wide selection of leashes and collars available you may have difficulty deciding what types are best for your dog. The following descriptions will help you make an informed decision. Choke chains are helpful for early in the walking stage, but they can be dangerous if they catch on something while you’re walking. As a result, choke chains should be used primarily for training. Loop the chain into a “P,” and slip it over your dog’s head. If he wanders while on a walk, gently snap the chain by pulling it back in one swift motion to return him to the correct position. Don’t pull hard: you’re not trying to punish your dog. Nylon leashes and collars are popular, sturdy choices for your dog. Nylon leashes are generally durable and are a good choice for a fun frolic. Harnesses are also popular, and are a good alternative for dogs who may pull too hard against a collar and injure or choke themselves. Retractable leashes give Spot the most freedom, but should be kept short for training. Many retractable leashes extend up to sixteen feet, so you can play games with your dog while he’s on the leash and quickly retract the leash if when you wish to return him to your side. A retractable leash is a good compromise between doggies freedom and owner control. Dog treats aren’t exactly equipment, but are just as essential for training your dog. Treats are a great way to get your dog to pay attention and they provide a nice reward for him when he does what you ask him to. a dog training book or video. Are Collars and Leashes Necessary? Collars and leashes help secure your dog when taking walks. Collars also bear identification tags containing the contact details of the dog owner. This helps notify people when their missing pet is found. One major importance of collars and leashes for dogs is training. Although not every collar is designed for training purposes, they are generally useful for obedience training. A good leash is a very handy tool for teaching your dog how to behave in the manner you want. A verbal command accompanied by a little tug of the leash will go a long way in reinforcing the desired behaviour. Picking the right collar for taking your dog on a walk could be quite tricky. You may also want to consider a harness rather than a collar. The leash type may be retractable or the regular one. It is important to note that whatever collar, harness or leash you decide to use should be comfortable to ensure that walking and training would be a happy experience for the dog. Training gear for dogs should be comfortable, safe and easy to handle. This ensures that the learning process goes smoothly, assuming relationship-based training is our chosen path. There are a couple of things to consider when picking out good training collars and leashes for small or large dogs. A good owner considers the safety of his dog when getting a new collar or leash. Some collars are made of reflective materials to make sure that they are easily seen in the dark. This helps prevent anyone from bumping into the animal to ensure the safety of both people and the dog. Some dogs tend to get easily distracted during walks and eventually pull on the leash. 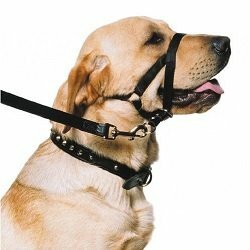 Both collar and leash should be made of strong durable material that will not break easily. Knowing the weight of your dog enables you to make the right choice of collar or leash. The belt buckle-style collars are preferable for larger dogs because they are secure and not easy to slip away from. A happy and comfortable dog is easier to train than one that is afraid or in pain. Knowing your breed and its characteristics make it easier to decide whether to use a collar or a harness. A harness is suitable for dogs that are prone to respiratory problems as collars could be uncomfortable for them. If you decide to pick a harness over a collar, choose one that allows your dog to move freely without restrictions. They should be adjustable to fit your dog perfectly as it grows. Beginners should avoid the use of collar types that may cause health issues from excessive pulling. The use of choke, prong, or e-collar requires a certain level of expertise. Training works best if both the dog and owner are comfortable with the procedure and tools involved. You will dread going on walks if your dog’s leash, collar or harness is difficult to put on or take off. Dogs tangling on the leash may cause discomfort as you need to untangle them every time. Depending on the type of environment you live in, a collar with quick-release feature may be suitable to ensure its quick removal whenever your dog gets caught in a dangerous situation. A dog might be choking when tangled in a leash, snapping it free from the collar while you try to untangle ideal. 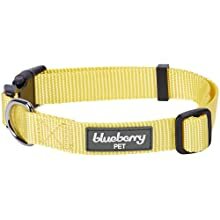 The Blueberry Pet collar is a type of flat collar with a quick-release closure made of plastic and a ring for attaching identification tags or a leash. It has a neck girth size of 15inches which can be extended to 22 inches through the adjustment buckle depending on the size of the dog. 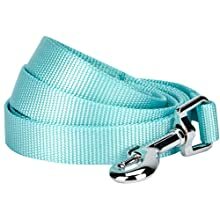 The collar is made of thick closely woven non-elastic nylon fabric and a chrome coated metal D ring for added durability. The adjustment buckles and quick-release closure are made of eco-friendly plastic. When putting on the dog collar, endeavour to leave enough room for two fingers between the collar and its neck to avoid discomfort or choking. During obedience training for dogs, the use of a good and secure collar combined with positive reinforcement ensures the best results. 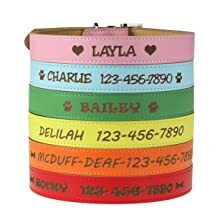 This pet collar comes in a wide array of colours. The Custom Catch collar is a type of flat collar made from leather with a metal belt buckle and a ring for attaching a leash. The leather is imprinted with identification information or other preferred text according to the demands of the owner. There are a wide variety of fonts and symbols to select from at no extra cost. 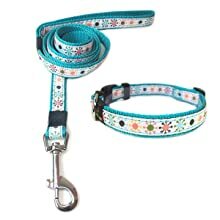 The collar comes in different sizes with a neck girth size of 12inches which can be extended through the belt buckle depending on the size of the dog. The collar should not be closely fitted as it is made of inelastic material. Endeavour to leave enough room for two fingers between the collar and its neck to avoid discomfort or choking. The Custom Catch collar is among the best dog collars for small and large dogs. It is secure, durable and fit for training young dogs to prevent unpleasant behaviour. The Tifereth dog leash is thick and highly durable. The 1-inch-wide leash is made of densely woven nylon material with a clasp and loop on opposite sides. The loop is a neoprene cushioned standard handle for comfort during routine strolls. It helps prevent rope-burn by reducing friction on the hand when the dog is pulling on the leash. This model comes with an extra cushioned traffic handle along its length which enables you to safely guide your dog through crowded streets. 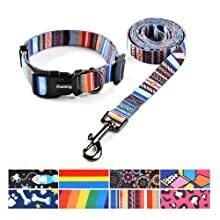 There are reflective stitches on the leash that improves visibility at night to ensure the safety of your dog and other pedestrians during late evening walks. The metal clasp on one end of the leash is strong enough to hold your dog securely during training. It is suitable for large and medium-sized dogs. The Dual Tangle-Free dog leash makes it easy to walk two dogs simultaneously. Walking two dogs with separate leashes is difficult as they tend to tangle constantly. This dog leash has a double lead with rotating metal buttons that save you the trouble of untangling during a walk. The handle is a loop made of soft material to avoid injury to the hand from friction when the dog is pulling on the leash. It is made of strong durable nylon fabric that will not break when both dogs are pulling on the leash. It has a zinc alloy adjustment buckles for extending the leash to allow the dogs to move freely during walks or training. Extra features include two identification tags containing the contact details of the dog owner. The Blueberry Pet dog leash is a standard flat leash made of thick durable material that can be attached to your dog collar through a clasp. The thick closely woven nylon fabric and a chrome coated metal clasp gives you full control over your dog to ensure safety during walks or training exercises. The leash is long and machine washable to maintain good hygiene. It is lightweight and suitable for all dog sizes because it does not break when the dog is pulling on the leash. The 5ft long Blueberry Pet leash comes in different colours to match the collars which can be acquired separately. 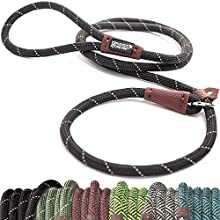 The Friends Forever slip rope is a durable mountain climbing grade dog leash with has a loop on one end that functions as a collar. It is a 10mm nylon rope slip lead which is lightweight and convenient for training. It is adjustable, easy to use and requires no external collar or harness. 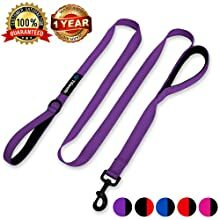 The 6ft long leash comes in different colours and is suitable for all dog sizes. Putting it on and taking it off your dog is quite straightforward. It is one of the most important large dog accessories every pet owner should have. This Azuza bundle comes with a 6ft leash and an adjustable collar of the same colour. 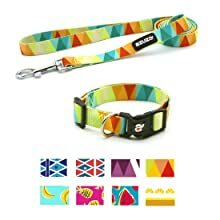 Many dog owners recommend it as the best leash and collar for a puppy due to the fact that it is lightweight and durable. Both leash and collar are made of thick closely woven nylon fabric. The leash has a loop on one end and a chrome coated metal clasp while the collar has adjustment buckles made of eco-friendly Plastic. The leash is long and machine washable to keep it clean. The Haoyueer Dog Collar and Leash Set is one of the most fashionable small dog accessories in the market. The collar is made of Polyurethane leather adorned with crystal rhinestones and an adjustable nickel-plated metal belt buckle and D-ring for attaching the leash. It comes in different colours and sizes, making it suitable for several dog sizes. The leash has metal chains and a clasp on one end while the loop on the other end is the handle made of leather. It is light, elegant and one of the best dog collars and leashes for training. The Annimos collar and leash set is one of the best dog collars and leashes for training. The collar has a quick release closure and adjustment buckles made of eco-friendly plastic and a silver D-ring for attaching the leash. Both collar and leash are made of durable closely woven nylon fabric of matching colours. The leash is machine washable and never fades. It is suitable for several dog sizes. The Ihoming pet collar and leash combo consist of a strong leash and adjustable collar both made of polyester. The collar has a quick release closure and adjustment buckles made of eco-friendly plastic and a stainless D-ring for attaching the leash. Both can be found in different colours and sizes for different dog weights. There are several dog collars and leashes to help customize your walking or training experience. Material type, size and design should be considered when selecting the right collar and leash for your pet. Remember that with the right training skills, your dog can behave in the manner you want using any of your preferred leash or collar.